Bus wraps are a sure-fire method for companies looking to increase exposure to potential customers. You don’t have to own a bus to benefit from bus wraps – many bus owners happily rent space on the interior and exterior of their buses for advertisements. Outdoor advertising is one of the most effective ways to reach viewers: OAAA-conducted research shows that 95% of Americans are exposed to outdoor advertising. When you account for traffic, that means bus wraps can easily garner tens of thousands of views per day. Your viewers are all the regular people who commute to work, run errands, or even bike or walk near roads. Whether you represent a major travel agency or own a local car shop, you can leverage that viewing power. If you own a bus and want to advertise for your own business, this article breaks down the expense versus benefits. For those looking to rent space on a bus, you will need to collaborate with the bus owner and a reputable wrap installer. Installing well-placed, colorful-but-legible advertisements on a bus will help you reach local consumers on a regular basis. City Bus Wraps The city bus system is prime real estate for advertisements. Government representatives can establish a relationship with one of our providers to install the ads they display via contracts with companies. Companies can work with us for ad designs and recommendations. Tour Bus Wraps With their impressive mileage, tour buses max out advertisement views and reach a national audience. Sports teams, musicians, and various entertainment professionals visit high-impact cities and cover significant territory, so getting ad placement on a tour bus wrap can be marketing gold. Fleet Bus Wraps If you own a fleet of buses for travel services, why let perfectly good advertising space go to waste? Market your own brand or find partner companies to tap into your fleet’s potential. Our providers can work with you to create a unified marketing strategy. If you have a fleet, all bus wraps priced below can be easily replicated and installed. Prices quoted are per bus. How long will my bus wrap last? Your bus wrap can last from five to seven years. Taking care of your bus wrap will ensure its longevity. How should I care for my bus wrap? In most cases, gently washing the wrap with a mild detergent and water is best. If you want to wax the bus, make sure that the wax is safe for bus wraps. Can a bus wrap damage my paint? We guarantee that our wraps will not damage your paint; in fact, by protecting your paint from UV damage and scratches, a bus wrap will extend the life of your paint job. You should bring in your bus so we can assess the extent of the damage. In many cases, it is possible for us to replace a small section of the wrap. In the worst case scenario, we will have to replace the wrap completely. 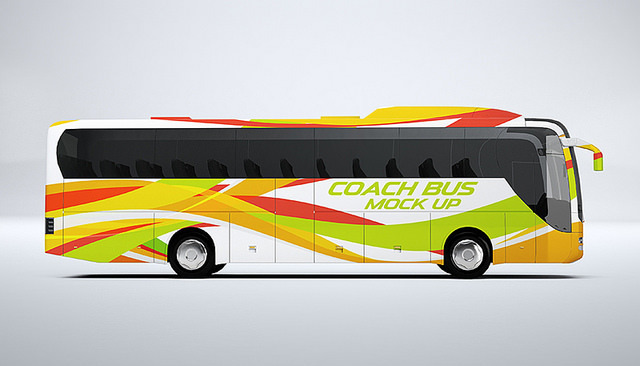 Do you provide customized bus wraps? It’s our specialty! We create and install the bus wraps to fit your bus exactly. You can also have us create a custom design for your bus. For details regarding your specific bus, please request a custom quote.